When you supersize learning materials, something magical happens: kids become instantly more interested in the subject being explored. Chess, for example, can be kind of boring for young kids. Five, six and seven-year-olds rarely have the patience to sit in front of a little board waiting for their next turn. But when a giant chess board and giant chess pieces appear on a school playground, those same kids fight for their chance to play the game. And, if super-sized materials can make chess fun, it can certainly make piano theory fun too. In today’s post, we’re going to show you how to supersize your piano printables and make them instantly more exciting. 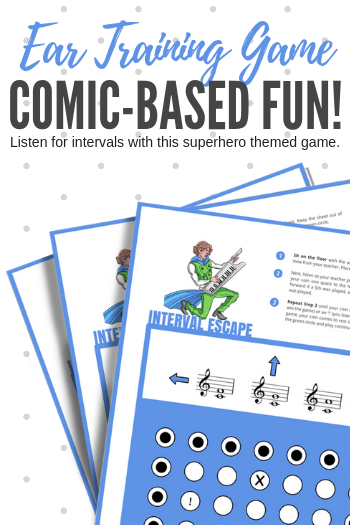 Let’s Supersize Piano Printables To Make Theory Thrilling! On the Teach Piano Today website and our WunderKeys website we share a ton of printable piano teaching activities (check out the links at the bottom of this post). Our printables are already pretty exciting. With game-based design and creative graphics, teachers have been using them for years to get kids pumped about note reading, rhythm and more. And while the easiest way to use our printables is in their current, standard paper-sized format, supersizing them every once in a while is a wonderful (and simple) way to bring some excitement to your piano studio. In fact, this post is inspired by our WunderKeys Facebook Group, where teachers regularly post pictures of supersize activities inspired by our WunderKeys Method Books. So, let’s get started. Below we have outlined five ways to supersize piano printables without breaking the bank. Spring has sprung, and this means your piano teaching can move outside to enjoy the pleasant weather. With some colorful sidewalk chalk, you can turn any street into a piano teaching printable. The game structure we shared in our Fearless Fortissimo printable below is perfect for sidewalk chalk piano teaching. The printable below reinforces listening for intervals which will not work outside where you do not have access to your piano. However, use the exact game structure to instead reinforce listening for clapped rhythms and you and your students will end up having a blast. Many of our printables contain graphics that can easily be recreated as monster manipulatives. Normally, the activity below uses the printable page and coins to reinforce finger numbers. However, if you want to have some supersized fun with this activity, it’s as simple as using some colored poster paper to cut out a giant apple tree and some giant apples. We have seen the activity below pop up in our WunderKeys group in its supersized form on many occasions. Check out the activity here on our WunderKeys website. Whiteboards are becoming a piano teaching staple in many studios. With a large whiteboard and some colored dry erase markers you can quickly supersize the fun with just about any printable. Activities like Soccer Ball Steps rely on simple structures that can quickly be drawn on a whiteboard. Click on the image to check out the printable. We have recently started releasing piano homework pages in the Members Only section of the Teach Piano Today website. As we create more and more homework pages, many will share a similar game structure (while teaching different concepts and using different graphics). For this reason, creating the basic game structure on laminated poster paper will allow you to reinforce many different piano teaching concepts. 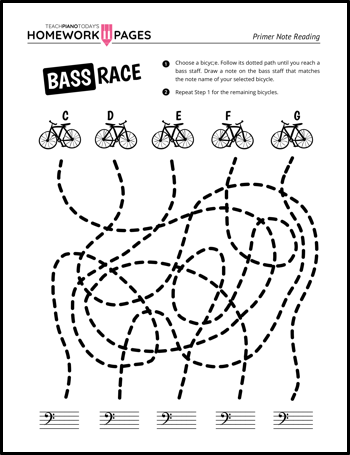 For example, the maze-based homework sheet below uses a simple design that can be quickly recreated on poster paper. When laminated, you can simply draw new note images and simple graphics every time you want to reinforce a different piano teaching concept. As mentioned at the beginning of this post, we share a ton of piano printables here on the Teach Piano Today website and over at our WunderKeys website. 1. 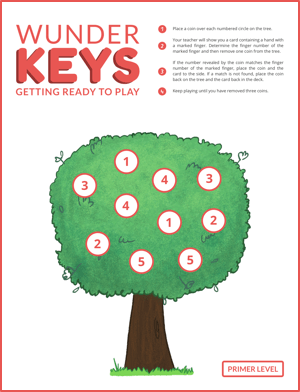 Wunderkeys Piano Printables – This page on our WunderKeys website contains piano teaching printables that correspond with our WunderKeys Method Books. And while they work wonders with our books, they can also be used as standalone activities. 2. WunderKeys Members Only Printables – Last month we created a Members Only section of the WunderKeys website called the Growing With WunderKeys Toolkit. We have started sharing most of our new piano printables here. In addition to piano printables you will also find a ton of studio-building resources in the toolkit. 3. Teach Piano Today Homework Pages – This is our newest piano project. 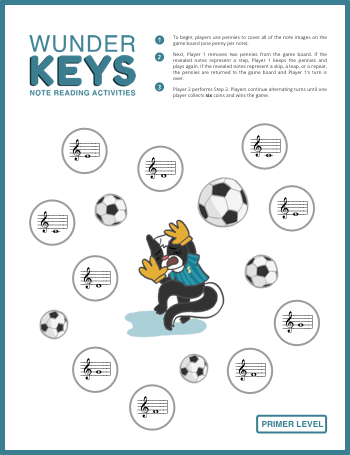 In this Members Only section of the Teach Piano Today website we have started to share piano homework pages that can be printed off and sent home with your students. The project is still young and we are adding three new homework pages every week. 4. 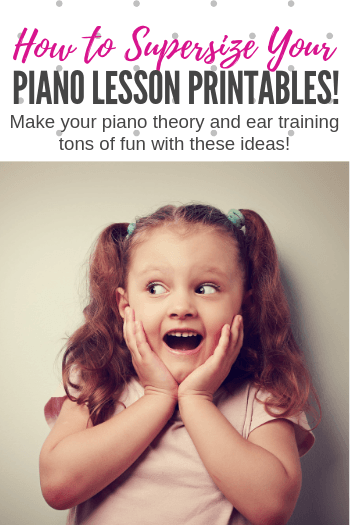 Teach Piano Today Printables – Since 2010 we have been sharing piano teaching printables here on the Teach Piano Today website. If you want to build your collection fast, click on the Piano Printables tab in the menu at the top of this page.